I come from a long line of pretty religious ancestors. My mom’s Spanish Creole Ximenes people were Catholics from Nachitoches, Lousiana. They eventually ended up Anglicized, staunch Missionary Baptist folks in the Pineywoods of deep East Texas. My dad’s people on the other hand held the secretary position in the Arcadia Missionary Baptist Church for generations until my Granny Ruth decided to start a Catholic Church in Shelby County and was of course bounced from the church rolls for “denying the faith.” I not only got my love of flowers from her but my rebellious streak as well. This naturally precludes a saintly disposition for me, but it’s not as far-fetched as it sounds. I was actually born on November 1, All Saints Day. To be perfectly honest, my mom says I was a day late and should have been born on Halloween. I suppose that’s when she changed my name from Demon Gregory Grant to Damon Gregory Grant. But Rebel Eloy Emanis, the only grandfather I knew, and idolized as well, was named for a Spanish saint. His grandfather Firmin Emanis was named for a Spanish saint too. And still yet, Firmin’s grandfather, Francisco Ximenes, was also named for a Spanish saint. With that lineage, I’ve certainly got my work cut out for me. I recently toured a number of wonderful gardens while attending the Southern Garden History Society meeting in Baton Rouge Louisiana (see southerngardenhistory.org). One of the gardens we visited was Miss Sarita’s garden not far from St. Francisville. 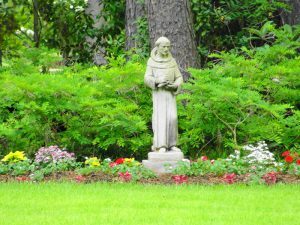 It wasn’t that much of a surprise to see that her garden had a religious theme and featured a number of crosses and statues of St. Francis. Truthfully I can’t tell you much about very many saints, but I have always had an affection for St. Francis, as I always heard he could talk to the animals. Of course you know I love plants, but I’m an animal lover as well. My siblings and I grew up with pet dogs, cats, rabbits, chickens, ducks, turtles, possums, raccoons, and even a squirrel. Not just any squirrel mind you, but a house squirrel. At this point you’re probably thinking my mom was the saint. You’ll get over that in due time. Once while visiting my grandparents in Arcadia, my Papaw told us to go look inside the large metal trash can in the bathroom (one of the few heated rooms in the house) and “pick you out one of ‘em to take home.” Of course the four of us, all a year apart, crammed our way into the small room and carefully removed the lid. Much to our surprise there was a “nest” of baby fox squirrels curled up amid rags in the bottom of the can. He had recently cut down a tree containing a squirrel nest and was apparently too soft hearted to let them perish. Either that or he was going to feed them and fatten them up for the other heated room in the house, the kitchen. He certainly liked to eat squirrel dumplings. We gently picked out one to take home and named him Caleb. Our sweet Caleb was certainly going to have no part in Papaw’s dumplings. Caleb lived inside our Longview home and grew up to be a happy house squirrel. His favorite activity was racing from curtain rod to curtain rod above the windows. Of course I loved plants as well as animals and was quite proud of a sweet potato vine growing in our own bathroom. I started it from a sweet potato in a jar of water. It had grown so luxuriantly that I trained the vines all around the bathroom mirror. It looked like a scene from one of our books, Where the Wild Things Are. Once while the whole family was gone, Caleb took a liking to sweet potato greens and ATE the whole botanical display. Of course it didn’t sit well with his nutty little stomach and he developed a serious case of projectile diarrhea, which combined with his love of running around on top of the curtains, DID NOT paint a pretty picture for our arrival home. When we walked into that house and my mother saw the curtains and walls streaked with green she shrieked a few choice non-saintly words, snatched poor Caleb by the tail, and flung him in to the yard, all the while muttering something about @#%^! squirrels living outside. Of course poor Caleb was a house squirrel, not an outdoor squirrel. 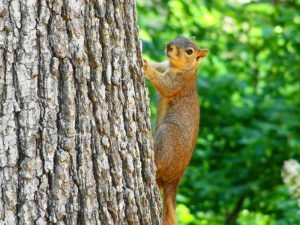 He immediately climbed to the top of a large Southern red oak just outside the back door while we children stood in its shadow and sobbed. Well along comes our loud-mouthed state bird, startling Caleb so much that the helpless thing falls from the top of the tree to the ground in front of our wet, red eyes. I’ve seen many fox squirrels jump from tall trees to the ground and run away completely unscathed but not our dear Caleb. He died right there in front of us while we all shrieked and blamed our never to be a saint mother! In her defense, she was talking to the animal, as she THREW him out the back patio door! I guess the Caleb episode is one reason I’ve spent my life loving and helping animals. Ironically, I’m particularly fond of birds. Once I rode all the way to College Station with a fully grown great horned owl in the Honda Civic with me. I was hoping to get his wounded wing repaired. That’s another story however. Recently while watering my new little cottage garden with the only sprinkler system I have, the end of a hose, a little ruby throated hummingbird flew a few feet from me and proceeded to take a bath in my garden shower. He splashed and drank and then landed on the double loop wire fencing next to my left arm while he dried and preened. I was stunned and amazed by the little fellow. 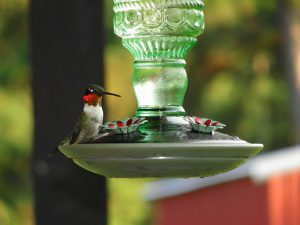 But the show continued as three more hummingbirds did likewise. I felt like St. Francis, or at least Dr. Doolittle. Whether they understand me or not, I do talk to the animals. 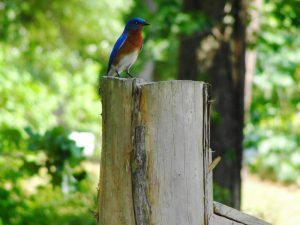 I have at least a daily conversation with one of my beloved bluebirds. If not good for them, it’s certainly good for me. There’s certainly no salve like the wonder of nature. Oh, I love this/these stories! So glad you'll be writing here! Loved reading about the squirrel and the "saintly" mother. Thanks, Greg! Greg, what a character you are.......my heart goes out to Caleb. What a great childhood you must of had growing up. Keep up the ramblings. One of the greatest joys of gardening for me is observing and enjoying the wildlife who share my garden with me. I can certainly relate to your stories of your adventures with wildlife. I can also relate to your Shelby County roots, since my husband is from there. I'm delighted that you will be contributing to Arbor Gate's newsletter and I look forward to reading your "ramblings" each month. I guess when you grow up in Texas house squirels are not that uncommon. We had a baby ground squirrel named Chippy that "ran our roost" until my brother moved the stereo on top of him while trying to retrieve him from behind the stereo. I've been lucky enough to meet and hear Greg speak on several occasions and he never fails to touch the very depths of my heart. To me, he is a saint! Biddy, The only way Greg can be classified as a saint is because he does not have a wife to tell him otherwise. Loved the story of Caleb and your wonderful "saintly" family. Being one of Greg's siblings, I, too, have fond memories of Caleb. However, I am now the mother of four boys and I must say my own mother's reaction was probably tamer than mine would be today! I am an avid reader but nothing entertains me more than my brother's witty writing. I was thrilled to see Greg's blog. I met him while he was at Mercer and I was a volunteer. Greg is a wonderful person as well as horticulturist. It is an honor to be able to read his articles on plants and animals and am so pleased that he is now a part of Arborgate. so happy to get to read greg on your blog! thank you! The vision of this story played out in my mind's eye makes me laugh! Your mom is a saint for all she endured (and still does) with the Grants. Keep up the wonderful writing. Hi Greg, I am up to roses in the book you and Dr. Welch recently published. It is marvelous, and I have been saving time for the roses. I just read this blog and the July edition, and they are wonderful too. 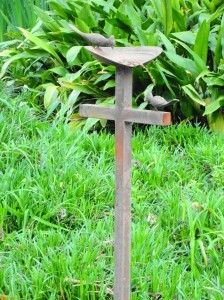 Many thanks to you and St. Francis. Greg is a very modest, humble writer and person who really lives what He writes. Greg truly loves birds, animals and plants and cares for them earnestly. He, also, is a wonderful and fun friend to all who know him. It is amazing all the articles and lectures Greg gives and then He still has time to find hidden plants and talk to the birds. Oh, I imagine the siblings have tales to tell that have never been told! Oh gosh, great story. Guffawing out loud and so would all of the strangers around me in this public place, if I would read this out loud. I just might, to share the fun. Wonder if Greg has ever had a sit down with Leon Hale? I'd love to be on the porch for that one.